I have decided to draw a line in the sand. Running with my dog one morning this week, I thought more about what I might have learnt on my Dark Angels course in Spain. Having made such a big investment – both in time and in cash – in my development as a writer, shouldn’t I be seeing a few changes? 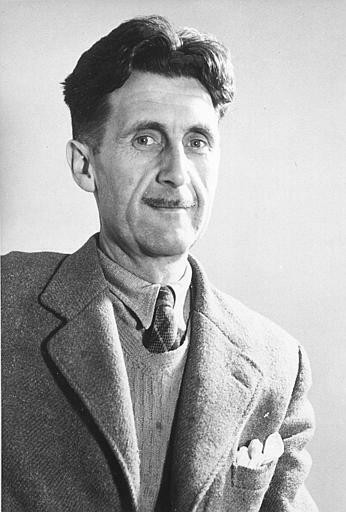 Orwell’s experience was a bit different to mine. He was in Spain fighting in a civil war; I was writing sonnets and drinking too much red wine. But even so, I liked the idea of drawing a line in the sand. I do feel like I’m on a bit of a threshold, actually. I’ve got a few big changes happening behind the scenes. Good ones. Really exciting ones. So I thought, yes, Spain will be a turning point for me, too. I will also draw my line in the sand. Now, I was going to leave it there. I thought I might blog about this turning point moment, but that would be it. I’d need a photo of a line in some sand to illustrate it, but a Google image search would do the job. But then I felt I was missing the point. This wasn’t just a metaphorical turning point. 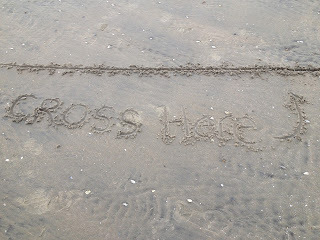 I needed a real line in real sand. So I put the dog in the back of the car and drove to the seaside. Our nearest beach is Camber Sands. Midweek, it is empty. The tide seems to go out for miles. There was plenty of sand. I wandered around a while, found the perfect spot and drew a line with my finger. I took a photo and walked down to the water line to reward the dog with a swim and to reflect further on my achievement. Then I realised that I hadn’t actually crossed the line that I’d drawn. This bothered me. I’d gone to all the trouble of driving to the beach, but hadn’t completed what I started. I walked back to my line, so I could take a symbolic step over it, but couldn’t find it. So I drew another one. 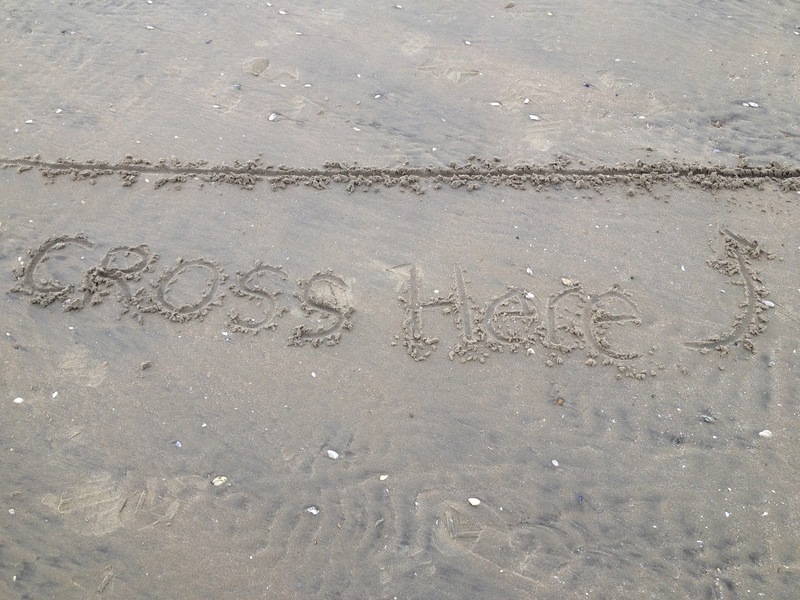 This time I was determined to make the crossing of the line properly meaningful. I reflected for a while about what the act I was about to perform meant to me. I wanted this to be something that I could look back on in five or ten years’ time and say, yes, that was a turning point. I came up with a form of words and spoke them aloud (remember, the beach was empty). Then I took a deep breath and stepped over the line. The line I actually crossed. Oh yes. I must say, it felt very good. So good in fact that I drew another line, for public use, in case anyone else came to the beach that day and wanted to create their own turning point. The tide will have washed it away by now. But blog readers, I urge you: give it a go. What’s the worst that can happen? Right? I guess you could drown. That would be bad.